There may be times when you need to remove or replace your security information for your Microsoft account. For example, if you get a new phone number or email address or if you mistyped your security information. This page describes how to remove and replace the phone numbers or email addresses you use to verify your Microsoft account. To remove and replace all of the security information for your Microsoft account, follow these steps. Note If you've removed and replaced your security information within the last 30 days, you'll have to wait until the 30-day period is over before you can do it again. This waiting period helps protect your account if an attacker gets your password. 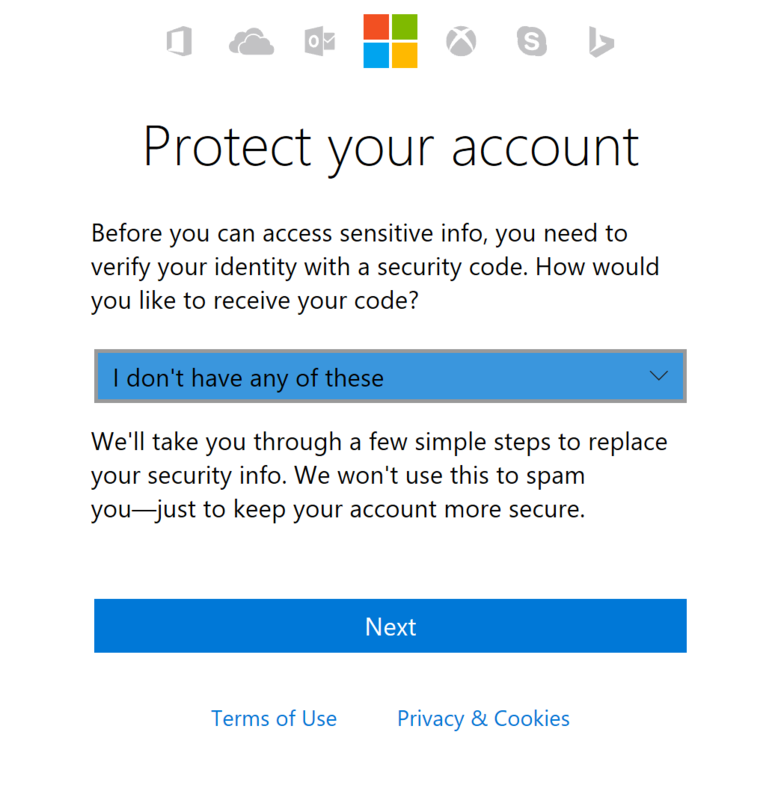 Go to Protect your account and sign in to your Microsoft account. The security code prompt appears. Select I don't have any of these, and then select Next. You'll be asked to add a replacement phone number or email address that we can use as security information. We'll contact you at the email or phone you provided. Follow the instructions to verify the account you're updating. The security information you chose to remove will be deleted in 30 days. During that time, we'll send notifications to the phone number or email address that's being removed, in case an attacker is attempting to remove your information. We can't expedite this process. You'll be able to continue using your console during the 30-day waiting period, but you won't be able to make changes to your password or use your account to make purchases online. You'll be unable to make security changes to your account or manage parental controls online. Would you like to contact Support regarding the "Update all of your Microsoft account security information" issue you were reading about or a different issue?